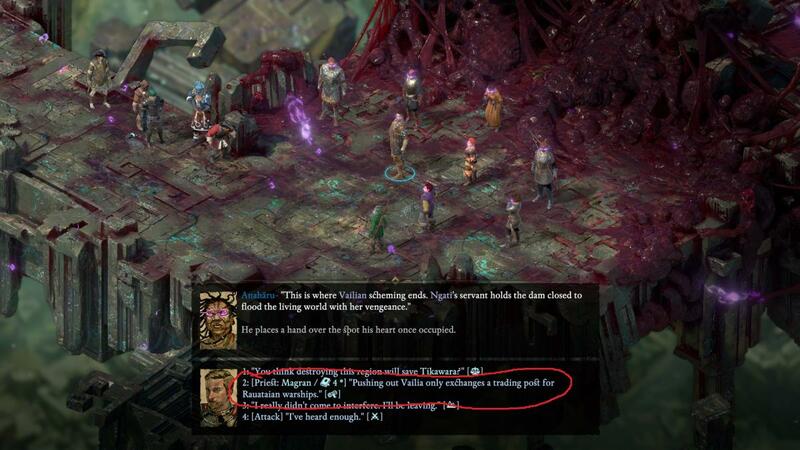 This is a really minor bug, but from a role-playing sense seems important. At the end of the Storms of Poko Kohara quest, when you're inside the corrupted adra, you are talking to the souls there and you can try to convince some of them to leave before fighting. Only problem is that this Priest: Magran option is a "diplomatic" option, and "diplomatic" is a disfavored reputation for a magranite priest. It seems like an oversight and an error that being a magranite priest opens up an option that Magran herself would disapprove of. It should probably not be a diplomatic option, or it should not be unlocked as a possible option for a magranite priest. In Pillars 1, there was a super-rare Waelite-only dialogue option (possibly the only one?) in a dialogue branch gated by having 2 ranks of a disfavored disposition (Honest). Which is to say, I doubt that this is the kind of thing that they're all that worried about. lolololol i played the waelite priest several times and never knew about this (probably for good reason).